Remember that awesome scene from Raiders of the Lost Ark where Marion Ravenwood drinks a man in her bar under the table while customers place bets all around her? Well, they were right to wager against her. Your average woman (and admittedly, Marion is not average) would not have stood a chance. In such a drinking game, a man has the biological advantage. Women, compared to men, produce significantly less gastric alcohol dehydrogenase. In other words, we women have less of the enzyme that breaks down alcohol in our stomachs. And with less enzyme present, more alcohol enters our bloodstream, making its way directly to our brains. And, no, a regular ‘training program’ will not provide us with a competitive edge. If we tried to do this, the increased levels of alcohol consumption would damage the lining of our stomachs… and have the opposite effect of reducing alcohol dehydrogenase production. 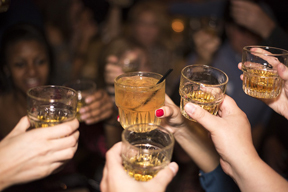 Better to leave drinking challenges where they belong – in fiction.